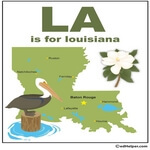 This section lists reading comprehensions on edHelper.com with references to the state of Louisiana. These reading comprehensions were not written specifically for the state theme unit. Lewis and Clark - Who Were They? Avery Island, Louisiana, Also Known As "Bird City"